Double-digit 12-month returns for large cap CRE prices over 30+ consecutive months have raised some concerns over the sustainability of this rising price trend. 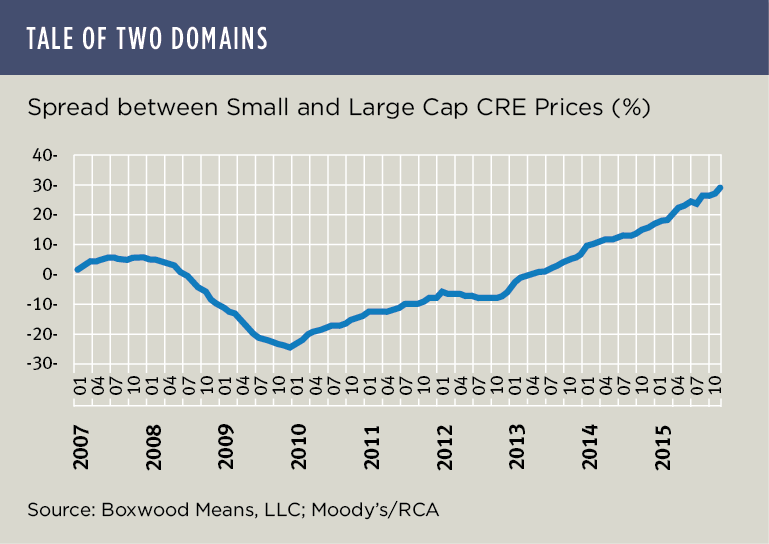 For some perspective, the graph nearby plots the spread between Boxwood's SCPI-117 national composite index of small cap CRE prices and large cap prices represented by the Moody's/RCA Core Commercial Index (excluding multifamily). As shown, prices for significant assets were 29.3% higher than small commercial asset values (under $5 million) as of November - the widest spread in at least eight years and pre-dating the last market's peak. Though average prices for assets in the small cap CRE domain typically recover at a relatively modest pace, this benchmark indicates that prices for institutionally-oriented properties have become untethered to, and a bit bubbly compared with price levels for smaller assets during this time horizon. It also suggests that in a relative sense the smaller CRE domain may offer investors potentially greater upside at this point in the cycle.